AFRICANGLOBE – Despite what the media would have you believe, 2015 is actually the safest year for police officers in 20 years. Meanwhile, police killings of citizens are at a 40-year high. While citizens and social justice groups seeking to curtail the trend of growing police brutality and state-sanctioned murder, police supporters around the country are seeking to debunk these reports with a combination of marketing, cherry-picked statistics, and misplaced nationalism formerly reserved for members of the military. 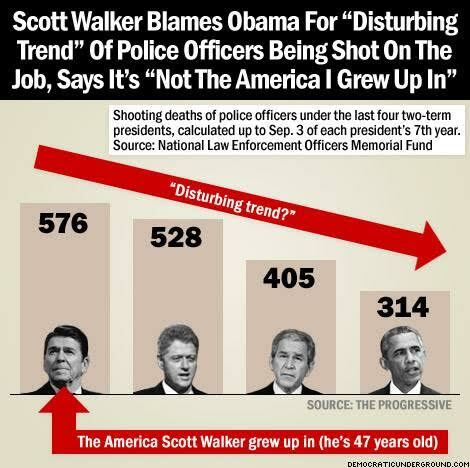 In an effort to be seen as pro-police and anti-Obama, unlikely GOP candidate and Governor of Wisconsin, Scott Walker wrote a piece on the website Hot Air where he blamed President Obama for the “disturbing trend of police officers being murdered on the job,” and that because of his “racially divisive attitude” that the country no longer resembles “the America I grew up in.” However, a review of the decreasing number of police being killed every year shows that when a young Scott Walker was growing up under President Reagan, there were almost twice as many police killed on the job than under the current administration.